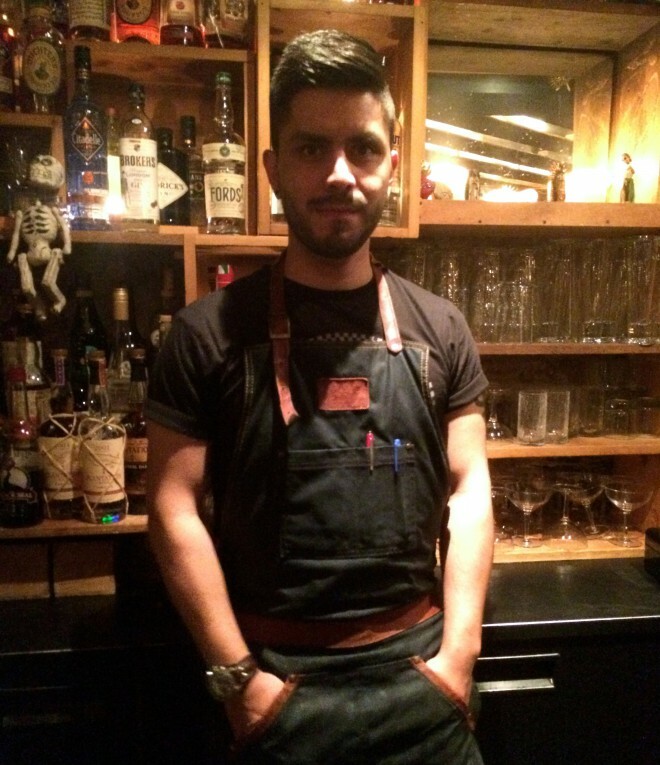 I’m Ivan Avellaneda, manager at the Candelaria in Paris where I’ve worked for the past 4 years. I am 28 years old and from Bogota in Colombia. Originally I was a psychologist and I came to France to get a masters in this field, but I’d always wanted to work somewhere involving drinks and food. In the beginning it was more of a hobby and a part-time job while I did my masters. I began working at the Candelaria and decided to dedicated myself to this bar and this industry. So, I did a hospitality management degree, so I could manage the Candelaria. Now this is my new life and I love it. I used to serve people as a psychologist, now it’s kind of the same, except I’m serving people in more festive way. I like simple stuff. I love amaro, xeres and vermouth, so my bar would focus on that. It would be in a wine cellar, so small, cosy and dark with a speakeasy vibe. It would hold around 15-20 people and be the kind of place to meet friends, have a drink, smoke and eat with music that makes everyone happy. As well as tequila and mezcal, I’d have a short list of 5 cocktails and people could also order what they want out of the menu. For me, I’d like the food to relate to the cocktails, like pairing. When I go out with friends we tend to go to cocktail bars for inspiration or to see other techniques bartenders are using. But as I enjoy wine and beer, I like to go to Red House, where you can have everything and just chill. You can have a good negroni, simple gin and tonic or a beer, it’s the same there. You can really feel at home there. For cocktails, I prefer to work with mezcal. It’s one of the most complex spirits, with it’s history and terroir. Each one has a different taste even if it’s the same agave or family. It’s small family provider for this spirit. You have to work on it everyday because there is always a new taste to discover. Tequila is quite the same. A good cocktail is about his story, a personality and of course more technically it’a about balance. When I say story, when you make a cocktail people have to taste what you have in mind when you create it and why you want to mix those tastes. It’s like my signature cocktail… it comes from my mother and the flavours from my childhood. After that, it’a about personality. If you want a funny one you have to see that with the garnish. Personality is about what you read on the menu and you need to feel each ingredient when you drink it, whether it’s simple or complex it has its own langage. I like bitterness, but I love spice and chilli or ginger. With chillies I like that you have so many different flavours. The Peruvian are soft, the Mexican are very tasty, and in Thailand they extremely hot. You need to find the perfect combination, maybe it’s easier to mix whisky and ginger than with mexican chilli, you just have to find the right balance. Here you should meet Sebastian the head bartender, he is very clever. In Paris just go to Red House to meet Joseph, I like the way he works and his mindset. He knows a lot about cocktails.